Some people don’t realize that banging on pots, pans, traffic signs, and buckets are a career option much less interactive entertainment. Actually, for most people it’s not. In order to make it work professionally and as interactive entertainment, you need hilarious comic timing, tremendous people skills, loads of energy, precise rhythm, dancing ability, improvisational technique, a knack for musical composition and funny jokes. You also need buckets — lots of buckets. Fortunately for their audiences, the Bucket Boys possess all these items and more. The Bucket Boys are from Chicago who have been performing all over the globe: at corporate events, casinos, Olympic beach volleyball tours, and on the Disney Cruise Line. They have been Illinois State Fair headline entertainment, and they’ve riveted the nation on NBC’s “America’s Got Talent.” And they’ve played Times Square, India, Dubai, and the National Association for Campus Activities (NACA) circuit. The Bucket Boys are ideal for small, intimate venues as well as enormous events with thousands in attendance. And they delight people no matter their ages or backgrounds; the Bucket Boys’ unique combination of music and comedy knows no boundaries. The appeal of a Bucket Boys show is that it’s so interactive entertainment. It’s about getting people — in many cases children — onstage so that they can have fun, amaze their friends and family members, and most importantly, learn how to do a Bucket Boy or Bucket Girl Solo. This solo involves side-to-side movements, 360-degrees spins, and whacking any number of barrels, cans, and other surfaces. Now, if you were to try these moves on your own in your kitchen, you might feel a little silly. But when you have the Bucket Boys coaching you, you don’t just look amazing; you actually transform yourself into a “mini-Justin Bieber.” It’s no wonder that the Bucket Boys are such a hit in schools across the United States. Many families today crave expert, wholesome interactive entertainment, the kind of family show that leaves you feeling better when you leave than when you walked in. The Bucket Boys excel at that kind of production. Their performances are packed with uplifting elements. Their passion for their music is palpable, and it often inspires students of music. What’s more, the strength of the Bucket Boys’ friendship — mixed with a touch of rivalry here and there — always shines through. And their dizzying movements inspire awe. As soon as one of their shows concludes, you might feel that the Bucket Boys rank among the best percussionist you’ve ever seen. 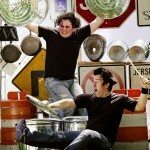 Of course, there’s one important difference between these two guys and all those other famous percussionists: The Bucket Boys keep their drumsticks inside a garbage can. To book an interactive comedy show with the Bucket Boys call 615-283-0039.